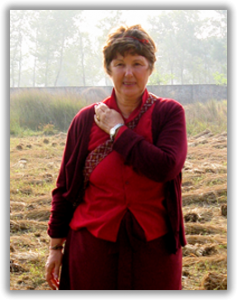 Jomo Lorraine is one of the founding directors of the Padmasambhava Buddhist Center. She has a keen interest in traditional Buddhist art, and the preservation of ancient ritual dances, chants and religious artifacts. Recently Jomo Lorraine helped the Ven. Khenpo Rinpoches complete Orgyen Samye Chökhor Ling Nunnery, the first nunnery located in the holy city of Sarnath, India.